Tree Removal: How Do I Know If a Tree Needs To Be Removed? It’s important to remember that dead or dying trees or branches can fall at any moment, not just during severe weather and storms. Tree removal can be a dangerous task that should not be attempted by a homeowner. Attempting to remove a tree or branch yourself can create a very dangerous situation in which both people and property can experience severe damage. Although you should never attempt to remove a tree yourself, there are several things you can look for in order to determine if you should seek help from a professional tree removal company like Adirondack Tree Surgeons. There are several ways in which you can identify if a tree is at risk of falling or losing a branch. Here we’ve outlined some of the main factors to look for in order to help you determine when you should contact a professional tree removal company. If you’re in doubt, seek a professional opinion from an expert at a reputable, fully licensed and insured tree removal company. Examine the tree for any leaning. Get to an area where you can see the entire tree and examine the tree carefully for leaning. Although trees can lean naturally, if you notice that the lean is something new or if you are unsure that the tree has had this lean forever, contact professional tree removers. A leaning tree can be an indicator that the entire tree is dead or dying and may soon fall down. Determine if you have any trees that might need to be removed before a dangerous storm or severe weather strikes. This can help you avoid causing damage or harm to your property or your neighbor’s. Inspect the base of the tree. The tree’s roots are a strong indicator of the health of the tree. When inspecting the base area, pay particular attention to the ground around the base of the tree. If you notice that the tree’s roots are visibly damaged or decaying, this can indicate that the tree has lost some, or in several cases, all of its structural support, putting it at a greater risk of falling anytime. In addition, make sure to look closely at the base of the tree where it meets the ground. Do you notice any space between the tree and the ground? If so, a new lean may have occurred causing the tree to be structurally unsound and in danger of falling. By examining the base of a tree and analyzing the amount of fungus or “sawdust” found there, a professional tree expert can also determine if a tree has become rotted or been eaten away by insects. Examine the tree trunk. Although cracks, crevices and cavities in the trunk can indicate that a tree is no longer structurally sound, cavities don’t necessarily mean that a tree must be removed. Cracks and cavities in a tree’s trunk should, however, be examined for their extensiveness. A professional tree expert will know if a cavity or crack has become too large for the tree to sustain. In addition, trucks also contain the most obvious clues to a dead, infested, sick or rotting tree. A clear indicator of all of these things can be that the trunk is missing large pieces of bark. It will cause you much less stress and headache if you remove a tree before it has the chance to fall and cause damage to your property, or your neighbors. 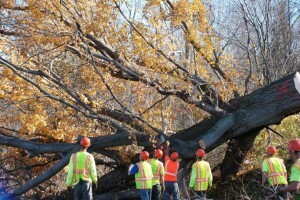 If you’re in Upstate NY, the Adirondacks or elsewhere in the Capital Region including Ballston Spa, Clifton Park, Malta, Glens Falls and Lake George and notice a tree on your property exhibiting any of the traits described in this article, don’t hesitate to contact the tree removal experts at Adirondack Tree Surgeons right away at 518-792-2225. This entry was posted in Branch & Tree Removal and tagged branch removal, tree removal. Bookmark the permalink.